Markiza Cake (Marquise Cake) - Let the Baking Begin! Hands down the most favorite and most requested cake in our family, this Markiza Cake gets requested every single time when there’s any celebration calling for cake. It is a bit tedious to roll out the dough and to put it all together, but if you can push through and make it you will get praises from all around the table. The buttercream can also be made with additional flavorings. The recipe below is for the classic version, but depending on your taste you can use cooked condensed milk (room temperature) instead of regular condensed milk for a bit of a caramel flavor, or add 1/4 cup cocoa powder to give it the chocolaty flavor, or even make it coffee flavored by mixing a tablespoon of instant coffee with 2-3 tablespoons of hot boiling water, then bringing it to room temperature and adding it to the buttercream. There are several people that makes this cake in our family, and each one of us has a favorite way of making it. 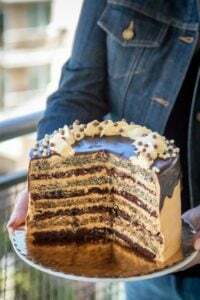 So depending on who brings this cake to the party, it will have a choice of above buttercreams to reflect our own favorites. The recipe below makes a huge 12 inches by 18 inches cake, so it is party sized already. It easily makes 50 servings, so if that is not how much you need, you might want to scale it back. I will include two different proportions for two different sizes. The step by step pictures will be from the 12×18 cake though. Happy New 2017 year everyone! May this one be the best one yet! Combine together the baking soda and vinegar, stir and set aside. Cream together the butter or margarine until smooth, about 2 minutes, scraping down the sides several times. Add egg yolks 2 at a time, creaming in between each addition. Add the sour cream, vanilla, and the baking soda mixture and cream until combined. Add flour in two additions and mix until the dough forms. Split the dough into 6 pcs and refrigerate for at least 30 minutes or up to 24 hrs. 10 minutes before you’re ready to roll out the dough, start making the meringue. Start whipping the egg whites going from low to high speeds. After about 30 seconds start adding sugar 1 tablespoon at a time until all sugar has been used. Now whip for about 5-8 minutes until the egg whites are increased in volume drastically and look very pearly white. Make sure the bowl and whisk are impeccably clean and no traces of grease or egg yolk have gotten into the egg white, or it will not whip up. Preheat oven to 350F, with the baking rack in the middle. Turn a 12×18 baking sheet over and place it on a damp rag to prevent it from moving. Work with one dough ball at a time. Roll it out thinly on the back of a baking sheet. Try to go over the edges. Now scrape the uneven edges off with a knife, then add scraps to the middle of the rolled out cake and roll them flat. Place about 1.5 cups of meringue on top and spread it into an even layer. Sprinkle about 1/2 cup of chopped walnuts on top and place into the oven to bake. Bake for about 15 -20 minutes or until the meringue is dry and the bottom (the cake layer) is golden in color. Remove to a cooling rack, or to a flat piece of foil placed on the table. If you have two baking sheets, you can start rolling one layer out, while the other one is still baking. Repeat the above steps with the reaming pieces of the dough. While the layers are baking, you can make the cream. Using a mixer whip up room temperature butter for about 5-7 minutes or until it is very fluffy and pale in color. Scrape the bowl several times throughout the process. Now, while continuing to whip, pour the condensed milk down the side of the bowl. Minimally whip, to avoid the buttercream from separating. Once you have all of your layers baked and completely cooled, start layering the cake with cream. Put a dab of frosting on a platter and place the first layer of cake on top, then press to adhere. Otherwise, you can leave the meringue up and make it serve the purpose of your ‘decoration’, like we did in the Holiday Cake. Continue layering until all cake layers are frosted. You should have some remaining cream to frost the outside of the cake in a thin layer of buttercream. If you do not have a large party to serve this big cake to, split it into two equal parts. One can be frozen (well wrapped), while the other one is eaten. Either way, cover the outside of the cake with a thin layer of frosting, hiding the cake layers underneath it. Use additional 2 cups chopped nuts, per each half to press against the sides of the cake. You will need about 3 cups nuts if you are keeping the cake whole. If you would like the intricate latice design on top, you will need to make additional buttercream with 230 gr butter (2 sticks) and 1 can sweetened condensed milk, by following the same directions on how to make it as above. Fill a piping bag with about 2 cups of frosting, pipe a border all around the top of the cake. Then make a lattice pattern like you see on the pictures. Using the same piping tip, pipe a little star inside each square and top with a chocolate crispearls. The cake can be left at room temperature or refrigerated until ready to eat. It is best to eat it after 12-24 hours in the fridge, but if you’re pressed for time, it can be eaten within 2-3 hours of making it. The additional time is needed to adhere the layers together and make it easier to cut it. 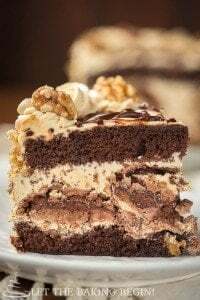 Hazelnut Meringue Nutella Cake Recipe – Layered poppyseed cake with a Nutella custard buttercream. 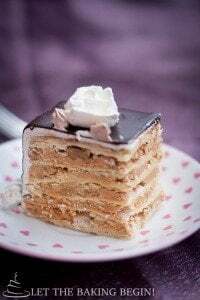 Esterhazy Cake – Hungarian cake with hazelnut meringue layers and custard buttercream. 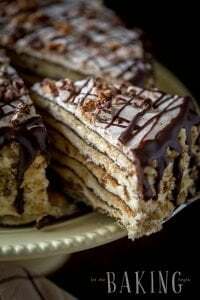 Holiday Cake – A classic Russian cake with a shortbread meringue cake and a custard buttercream. Split the dough into 3 pcs and refrigerate for at least 30 minutes or up to 24 hrs. minutes before you're ready to roll out the dough, start making the meringue. Start whipping the egg whites going from low to high speeds. After about 30 seconds start adding sugar 1 tablespoon at a time until all sugar has been used. Now whip for about 5 minutes until the egg whites are increased in volume drastically and look very pearly white. Make sure the bowl and whisk are impeccably clean and no traces of grease or egg yolk have gotten into the egg white, or it will not whip up. Turn a 12x18 baking sheet over and place it on a damp rag to prevent it from moving. Work with one dough ball at a time. Roll it out thinly on the back of a baking sheet. Try to go over the edges. Now scrape the uneven edges off with a knife, then add scraps to the middle of the rolled out cake and roll them flat. Repeat the above steps with the remaining pieces of the dough. Using a mixer whip up room temperature butter for about 5 minutes or until it is very fluffy and pale in color. Scrape the bowl several times throughout the process. Now, while continuing to whip, pour the condensed milk down the side of the bowl. Minimally whip, to avoid the buttercream from separating. Put about 1.5-2 cups of frosting and spread it around into a thin layer. If you would like to decorate the top with buttercream and make the intricate design like you see in the pictures, you need to put the last cake layer meringue side down. Otherwise, you can leave the meringue up and make it serve the purpose of your 'decoration', like we did in the Holiday Cake. Split the cake into two equal parts and stack them together, gluing them with some buttercream. Cover the outside of the cake with a thin layer of frosting, hiding the cake layers underneath it. Use additional 2 cups chopped nuts to press against the sides of the cake. Now fill a piping bag with about 2 cups of frosting, pipe a border all around the top of the cake. Then make a lattice pattern like you see on the pictures. Using the same piping tip, pipe a little star inside each square and top with a sugar bead. How many days can the cake stay in the refrigerator before serving it? I think up to two days with no loss in taste qualities, for sure! How big are the cans of condensed milk? Hi Marina!! Greetings from the Philippines. I’ve been eyeing to make this recipe for quite sometime and finally have a reason to since it’s my Dad’s 70th this weekend. 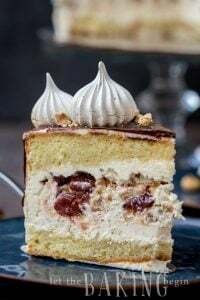 Am curious since I’ve never tasted this kind of cake, will the cake layers remain crisp? welcome to my site! Glad to have you here! Yes, this cake remains relatively crispy and crunchy. Just make sure to keep it refrigerated if you want the maximum crispiness. I would like to make this cake using hazelnuts. Have you tried this recipe with them? I have not made it using hazelnuts and I do think that pecans or walnuts would be better beaue the nuts are softer, but if hazelnuts is all you have, then it’s not going to be too bad. I have made this with hazelnuts and really enjoyed it! Hi Galina, I have had a similar thing happen when I had the dough sit in the fridge for a week and then I made the cake and it was fine. So I think you should use it, it will be ok.
Have you ever frozen this cake? I’m thinking to freeze it with this buttercream and the day before serving it add the final coat of Swiss meringue buttercream. It sure how well meringue cakes freeze. Just so excited to try this recipe. It actually does sound a bit complicated but nothing that a person cannot do,and the cake itself will be soooooo worth it. I am so happy to find this recipe and the instructions are really really easy to understand! Thanks so much! The cake is definitely not for when you are short on time, but definitely worth the result indeed! I’m excited for you to try it too! 1. make sure ingredients are all the same temperature (which you already did, as you said). 2. make sure you really whip the butter enough before adding the condensed milk. So I believe if you whip the butter for the full 5-7 minutes (if using a stand mixer) or even longer if you’re using a hand-held mixer before adding the condensed milk, it will increase the chances of your success greatly. Basically, you will start whipping it and after a minute or two you might think that you have whipped enough because it looks light and fluffy, but you will see that if you continue whipping for longer, it will turn even fluffier and even more pale white. Once it is whipped enough, there’s enough volume to support the condensed milk, otherwise there’s not enough volume so it will separate or just become very runny. 3. Butter fat % and condensed milk moisture percentage. Since both of those are variable by a little, you kind of have to play it by ear sometimes. If you use the same brand butter and condensed milk all the time, after a time or two you will figure out how much condensed milk your butter can take. Sometimes I will add only 3/4th of the can of condensed milk for every 2 sticks butter because I notice that the cream is starting to be too runny for my liking. So that might be something you might want to consider? European butter tends to have a higher fat percentage, so it can take more condensed milk than regular American butter (just an fyi). Thank you for the tips! Made this cake again over the weekend and the cream came out perfect! First, I prayed for God to help it turn out. I bought a diff brand condensed milk and followed all ur directions! Thanks again for all the tips and one of the best cake recipes ever!! That’s awesome! I always say a prayer when I bake, haha! Thanks for coming back to share your success! Thank you! and you can bake it ahead and just assemble it the next day. Since the layers are very fragile, you will need to be very careful with them and it is best to not really move them much after you take them out of the oven and place them on the table. Otherwise they might break and be hard to assemble. If it is an option for you to make the cake 2-3 days ahead, that’s probably better than leaving the cake layers on the table for a couple of days. The cake really doesn’t lose much by being assembled couple days ahead, so that might be an option too. This an amazing recipe, great instructions and really tasty cake. I made it for my husbands birthday and it was a beautiful cake. Thank you. I absolutely found the step by step instructions to be helpful! Thanks, will be making it again soon. Thank you Kitsyabella, appreciate you taking the time to share your feedback! Happy Birthday to your husband! Made this cake this weekend and it turned out excellent, except for one detail-it’s way too sweet! I think next time i make it, and i definitely will make it again soon, i will use 1/2 cup of sugar in the meringue instead of 1 and 1/2 cups. Other than that, i really like the flavors of the cake as well as the airy flaky texture. I didn’t have any problems rolling out the dough, just used parchment paper and nothing sticked! Thank you for great recipe! So glad to hear that everything went well and you enjoyed this cake. As far as the sweetness, that’s one of the things about this cake that people either like or hate. Nevertheless, I would not mess around with the recipe of the meringue because if you do, chances are it will not work .The amount of sugar in a way ensures that the meringue stays stable through the whipping process, and the baking. Since you’re whipping the meringue in the begining and then it just sits until all cake layers are baked, if you put less sugar it will deflate faster and not bake properly after the first layer. If you want to split the meringue in a couple of batches and whip it for every 2 layers separately, to ensure that it doesn’t sit for too long that might work, otherwise I would not do it. Even if you do decrease the amount of sugar, I would not go less than 3/4 cup per recipe. Thank you so much for the wonderful recipe. You take so much trouble to ensure that we succeed. I made your Napolean cake and it was awesome. everybody absolutely loved it. Thank you again. you are awesome!! 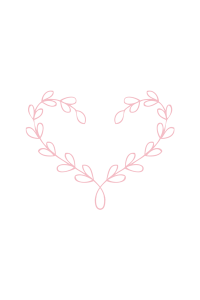 Hi, thank you so much! It’s nice to know that my work is appreciated :*. If you braved the Napoleon, you can bake anything! Was wondering what kinda tip for decoration did you used? It’s just a small, closed star tip. Have a daughter allergic to nuts…will excluding the nuts change this cake in any way other than taste and appearance? Do you have any suggestions for a substitute? I just made this cake for our NYE PARTY. I used silicone mats on my baking sheet and they worked perfectly. I bake all the time, but this has to be the hardest, messiest, most time consuming cake, but also the most delicious one I ever baked. I cut out the edges to make it more even, so we got to try a little bit. My oh my. Can’t wait to dig in tomorrow!! I’ll definitely make it again and again. Thanks for this recipe!! I was wondering about that, because I am about to use parchment paper. Thanks! You can use foil, parchment paper or roll it right out on the sheet. It has enough butter to not stick much.